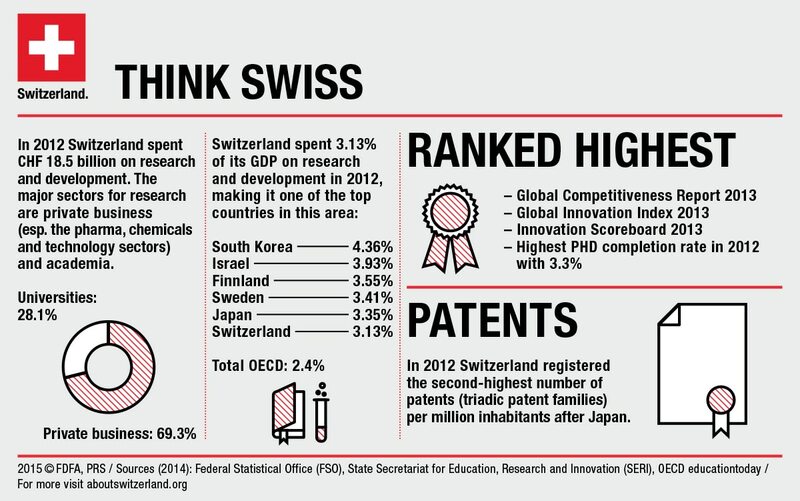 Did you know Switzerland is not only one of the world’s most innovative research nations, but also one of the most competitive. 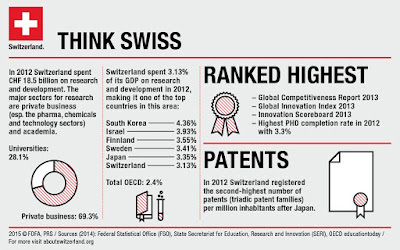 Switzerland is one of the most dynamic countries worldwide in terms of research activity. - This little country invests close to 3.4% of its GDP in research and development (R&D). It is also among the countries with the highest spending on R&D in relation to GDP (4th in the OECD rankings). - In monetary terms, Switzerland spends CHF 22 milliards on R&D. The private sector accounts for most of the funding and execution of this work (86% and 71% respectively). - Swiss researchers produce roughly 1.2% of all scientific papers published worldwide, putting it in 17th place in international rankings. If we consider the actual number of papers produced in proportion to the country’s population, Switzerland comes top of the class, with an average of 3.9 publications per 1,000 inhabitants. These papers are highly acclaimed internationally: in terms of impact, Switzerland exceeds the global average of 17% and takes third position after the United States and the Netherlands. - In 2013, Switzerland had 269 patent applications per million inhabitants. Only Japan files more patent applications per capita than Switzerland. - In the 2016-2017 Global Competitiveness Report by the World Economic Forum (WEF), Switzerland was ranked first for the eight time running. - Switzerland ranks first in the Global Innovation Index 2017, published by Cornell University, INSEAD and the World Intellectual Property Organisation (WIPO). - Since being founded in 1952, the Swiss National Science Foundation (SNSF) has reviewed more than 70,000 research funding applications and has enabled over 20,000 talented young researchers to undertake a research period abroad. - The Commission for Technology and Innovation (CTI) supports applied R&D projects, as well as the creation and development of start-ups and also knowledge and technology transfer. In 2016, the CTI used federal subsidies totalling CHF 184.6 million to fund 539 projects. - Switzerland’s two federal institutes of technology in Zurich and Lausanne are renowned worldwide for their cutting-edge scientific output. They also have a long tradition of attracting foreign researchers and lecturers, with over 50% of teaching staff in both institutes hailing from outside Switzerland. - The Federal Institute of Technology Zurich (ETHZ) came 8th in the 2016 QS World University Rankings.